Synopsis: After murdering his entire family, a man remarries a widow with a teenage daughter in another town and prepares to do it all over again. Review: Long before he reached a career zenith with his role on television’s Lost, Terry O’Quinn was mostly known as “that one guy in that one film”. A dependable character actor, he popped up in big movies and small but was rarely required to truly carry the heft of a film and if you look over his resume you’ll see he’s worked with just about everyone. 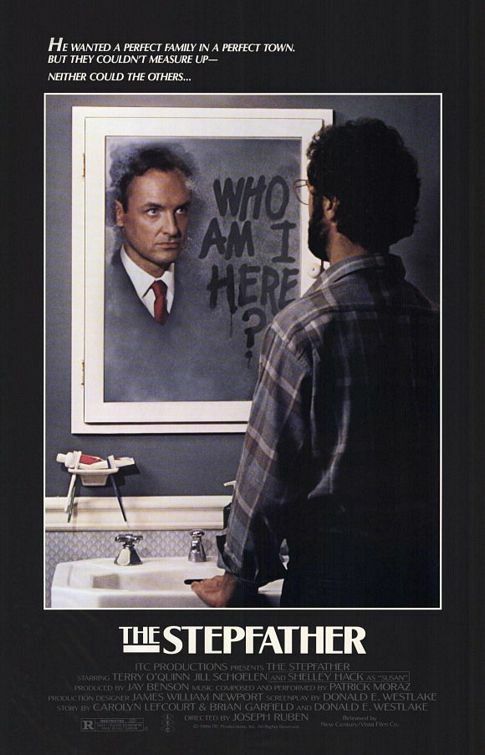 However, back in 1985 when The Stepfather went into production (it wasn’t released until 1987), O’Quinn wasn’t a familiar face and that worked to his advantage in showing that his harmless appearance masked a nutball determined to find the perfect family. Opening with the grisly tableau of murder and the blood soaked man that did the deed, The Stepfather jumps ahead in time to find Jerry Blake (O’Quinn) settling in with a new family in a new town. His new wife Susan (Shelley Hack) thinks he can do no wrong and is grateful to have a man around the house but his stepdaughter Stephanie (Jill Schoelen, a popular fave in horror films of the ‘80s) isn’t too keen on the guy. Stephanie isn’t just bugged by Jerry’s cornball old school values, she’s wary of his outbursts that don’t align with his calm demeanor. Director Joseph Ruben moves the pieces around nicely for the first half of the film, creating tension as Stephanie does some detective work while Jerry knocks off anyone that gets in the way of his happiness. He eventually realizes that Stephanie has to go but doesn’t bet on the fact that as much as he’s willing to kill for the perfect family, Stephanie’s just as game to keep him out of hers. It gets a bit heavy-handed as it unspools with the final showdown gratuitous on many fronts…such as a strange shower scene for Schoelen that feels icky and exploitative. O’Quinn is scary good here, treading the line between tightly wound and out of control with a nice balance. He makes the character more than just a killer in a tweed jacket and argyle socks and brings a real sense of psychosis to Jerry. Hack is sorta bland but that’s also how her character’s written. Even so, you’ll be driven mad by how long it takes her to catch on that her new husband is cuckoo. As is usually the case, Schoelen is an engaging heroine that you’re willing to root for. With a voice that always sounds like she was screaming for hours the night before, she’s a nice fit with the role and a good match for O’Quinn. While The Stepfather ends with a pretty final dénouement, if you do your homework you’ll see that it spawned two sequels, the first of which featured O’Quinn reprising his role in what’s basically just a remake of the first film. It’s a decent sequel but steer clear of the third entry that recasts its lead and doesn’t drum up much excitement. A modern remake was released in 2009 but it failed to make anyone forget how solid the original film was.